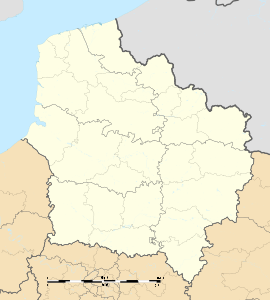 Harponville is a commune in the Somme department in Hauts-de-France in northern France. Harponville is situated on the D47 road, some 20 miles (32 km) northeast of Amiens. The village of Harponville is first noted as belonging to the abbey at Saint-Riquier. Later it becomes a strongly Protestant place, owing to the Raincheval family’s influence. Burials took place in the gardens of their home. At the beginning of the 19th cenruty, the cordiality between the two denominations was such that they decided to build a wall in the old parish church, Catholic on one side, Protestant on the other. This wall was later demolished and a church for the Protestants was built in 1823 and rebuilt in 1863 after a fire. The village was unaffected by World War I. A defensive system of trenches and a blockhouse were set up in the ‘’Bois de l’Abbaye’’ near ‘’Mont d’Harponville’’ which kept the village safe. Wikimedia Commons has media related to Harponville.